I was thinking something simple but fun for dinner. I had some ground turkey in the freezer (yes, I checked to make sure it wasn't the kind included in the recent salmonella recall) and two heads of cabbage (one red, one white) left from my barley salad, so I decided to make cabbage wraps. 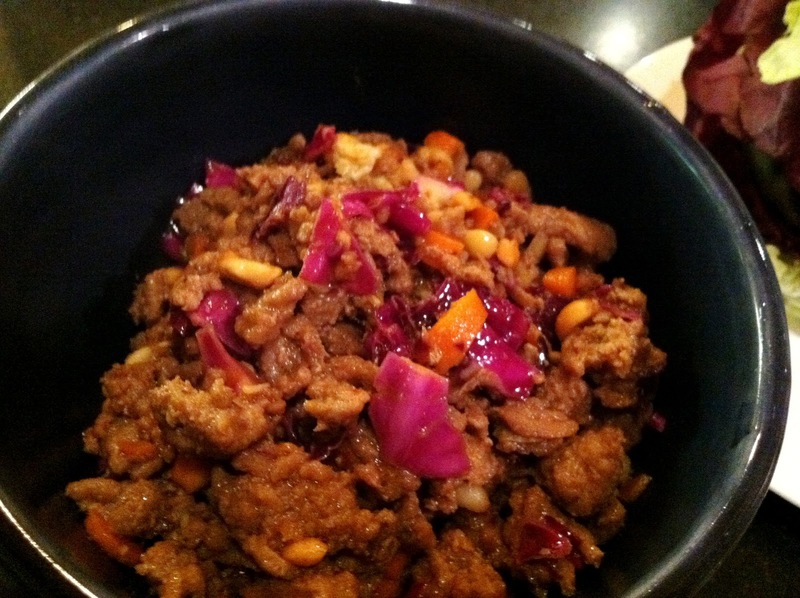 I'd make a yummy, Asian-inspired ground meat (or turkey) mixture just like I would for lettuce wraps, but I'd use cabbage leaves instead. I figured the cabbage would add a nice tangy bite to the sweet/salty turkey mixture. I peeled off the first few leaves of each cabbage and washed them, then chopped into small pieces and set aside. Then, I cut off any excess stem and gently peeled off about six leaves from each, then rinsed them and set on a clean towel to dry. In the meantime, I added about 1 TBS of sesame oil to a large skillet and put the stove on medium heat. I crumbled the entire package of ground turkey (about 1 lb.) into the pan and stirred until it was no longer pink. Then, in went 1 TBS of soy sauce, 1 TBS of minced garlic, 1 TBS of minced ginger, 4 TBS of hoisin sauce, 3 tsp. of fish sauce, 1 TBS of rice wine vinegar, and 3 tsp. of red chili paste. I stirred this into the turkey and continued to cook it until it was lightly browned and the sauce had thickened a bit. Then, I added in a handful of chopped unsalted peanuts, a handful of pine nuts, the chopped cabbage, and 1/2 cup of diced carrot. You could also add some onion, but we all know how Chris feels about onion, so I didn't include. Once the veggies had become slightly tender and the turkey was fully cooked, I took a taste and adjusted the seasonings as needed. You shouldn't need to add salt since the soy sauce adds enough of that, but mine was a bit too sweet at first (the hoisin poured out of the bottle too quickly), so I added in a wee bit of water and a dab of butter to tame it a bit. I also wanted a bit more heat, so I added a few splashes of sriracha (hot chili sauce). Then, I took the cleaned cabbage leaves and stacked them on a plate, alternating the red with the white and transferred the turkey mixture to a bowl via a slotted spoon. (You don't want to take any extra liquid with you or it will make eating the wraps a messy experience.) 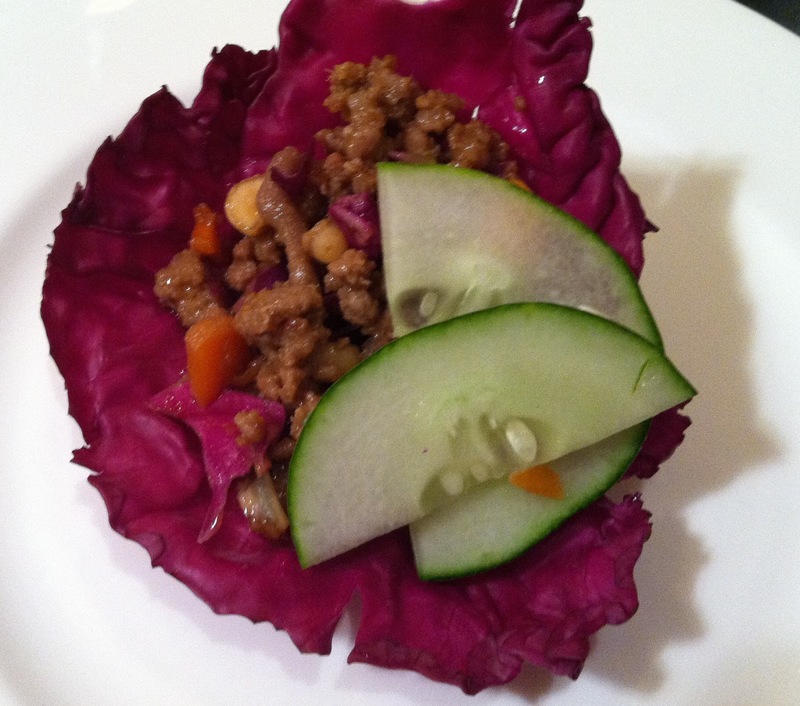 I took a cabbage leaf, added a few spoonfuls of the meat mixture, topped it with thin slices of cucumber (cilantro would be a nice add, too, but I didn't have any fresh) and took a bite. Sweet, salty, spicy and crunchy...yum! 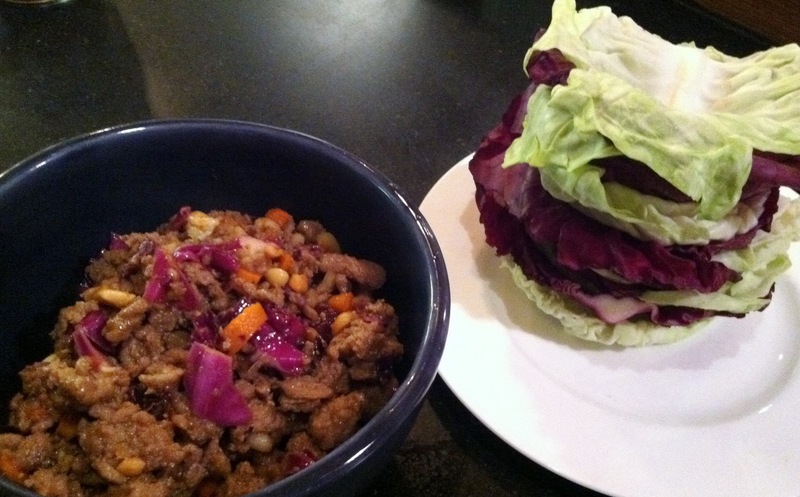 It still needed something though...and if I recall, lettuce wraps usually come with some kind of special sauce. I had just the thing! My super cool mother-in-law brought us a goody basket full of their local (Western NY) homemade treats when visiting last week, including a luscious mango salsa. I put a wee dollop on top of the mixture before rolling...delish! Chris was a bit skeptical about me choosing to use cabbage instead of lettuce for the wraps, but he came around pretty quickly. After the third bite, he proclaimed himself a fan.